Human intervention quickly followed. And so we have one home-grown, hand-reared pet lamb! She is strong, a good drinker, and a dedicated follower of the head gardener's blue gumboots. Her merino neck wrinkles are small, cute, and still creamy white. 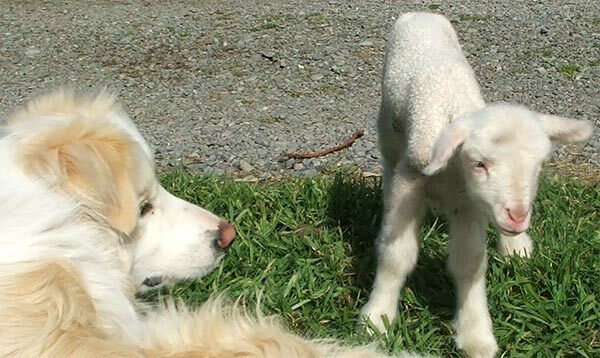 The thought of caring for a new-born abandoned lamb might be a little scary, but the reality is simple. First, a feed of colostrum, then a safe, warm netting creche with soft hay, and small feeds of lamb milk formula - six times a day for the first two days, progressing to four... After feeding time we all go for a walk - the blue gum-booted gardener, the lamb, the fluffy ginger cat and the dog. We must make a pretty picture! 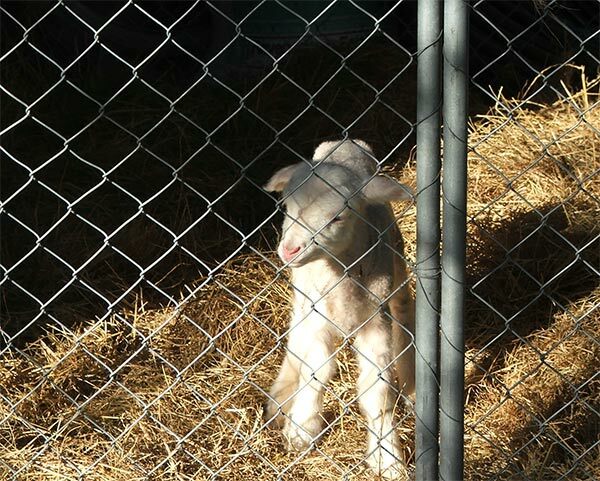 Already our pet lamb has a name - she's called Hura, a Japanese name meaning 'spring'. Rusty the dog knows the call already - 'Hura Lamb!' - and races off over to the barn where the lamb creche is. Despite mother ewe's total lack of interest, little Hura Lamb is thriving. Already she's running and bouncing high in the air, and starting to snuffle around my garden. Hmm... How long will it be before those tasty new rose shoots smell good enough to eat? These first photographs were taken when she was just 24 hours old. What a good life! It will be lots of fun raising her, especially knowing that lamb roasts are strictly forbidden on the Moosey dinner table! Your ear-tag number has been noted. You've really messed this up, and are being dishonourably discharged from mothering duties.